No matter what your sport — skiing, snowboarding, hiking, biking, golfing, whitewater rafting, kayaking, horseback riding, paragliding or fly-fishing — you can enjoy it in the Roaring Fork Valley of Colorado! 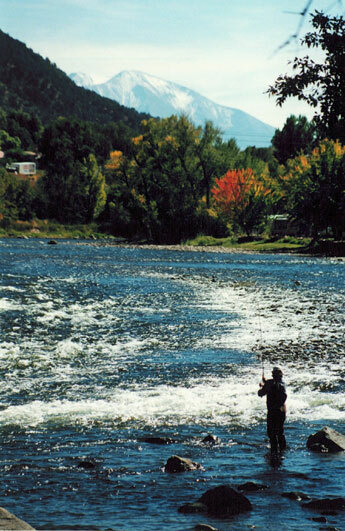 The Roaring Fork is situated along the corridor of Highway 82, from Glenwood Springs to Aspen. Within that corridor, you will find quaint and delightful communities such as Carbondale, Basalt and Glenwood Springs. Carbondale is named one of the “Top 10 Adventure Towns in the US” by National Geographic Adventure magazine, and boasts an annual average of 295 days of sunshine. Mount Sopris, towering above the area, is a landmark mountain top that invites hiking, biking or just enjoying the view. Carbondale hosts several festivals each year, attended by locals and visitors from all over the state and the world. Basalt is a fishing paradise with the confluence of two Gold Medal rivers, the Frying Pan River and the Roaring Fork River. Whether fly-fishing or river rafting, the area reveals some of the most spectacular scenery of the Rocky Mountains and the White River National Forest. Glenwood Springs is the largest city in the Roaring Fork area, well known for its mineral Hot Springs Pool, beautiful old hotels and unique shopping experiences. Restaurants, specialty stores, and the best of small town living thrives throughout the Roaring Fork Valley. Toni Cerise is your best resource for choosing a permanent place to enjoy the benefits of living here – call her today!